President Barack Obama, Vice President Joe Biden, National Security Adviser Susan Rice, and Defense Secretary Chuck Hagel made a series of private phone calls to top congressional Republicans–and some Democrats–on Monday and Tuesday to rally support for the president’s decision to launch airstrikes against ISIS bases in Syria, according to CNN. “On Monday, President Obama personally called House Speaker John Boehner, House Minority Leader Nancy Pelosi and Senate Majority Leader Harry Reid to notify them that the military operation inside Syria would begin in the evening,” CNN’s wire service reported. Biden “reached out to one of the administration’s most vocal critics, Sen. Lindsey Graham,” and to Senate Intelligence committee chairwoman Sen. Dianne Feinstein (D-CA) and that committee’s ranking member Sen. Saxby Chambliss (R-GA), according to the report. “Key Cabinet leaders also reached out to top committee leaders. Defense Secretary Chuck Hagel called House Armed Services Committee Chairman Buck McKeon, and National Security Adviser Susan Rice called House Foreign Affairs Committee Chairman Ed Royce,” CNN reported. President Obama never sought nor obtained formal congressional approval, as key lawmakers in both parties say the U.S. Constitution requires, for the military actions that began Monday evening. But, in part boosted by the personalized lobbying campaign, top congressional leaders are registering early approval. Chambliss issued a statement late Monday that was supportive of the strikes, as did Royce and McKeon. The widespread lobbying effort by the administration allowed the president to tout Tuesday morning, as he spoke on the strikes, “bipartisan support” in Congress for the actions. However, Rep. Justin Amash (R-MI) criticized President Obama for not seeking congressional authorization, as well as congressional leaders like Boehner and Senate Majority Leader Harry Reid for not fighting for Obama to seek congressional authorization. “It’s irresponsible & immoral that instead of debating & voting on war, congressional leaders chose to recess Congress for nearly two months,” Amash said via Twitter on Monday evening. Sen. Rand Paul (R-KY) has also said that while he supports striking ISIS in Syria in this manner, he thinks Congress should have approved it. “I support military action against ISIS but continue to believe the Constitution requires the President to receive Congressional authorization,” Paul said in a statement provided to Breitbart News. 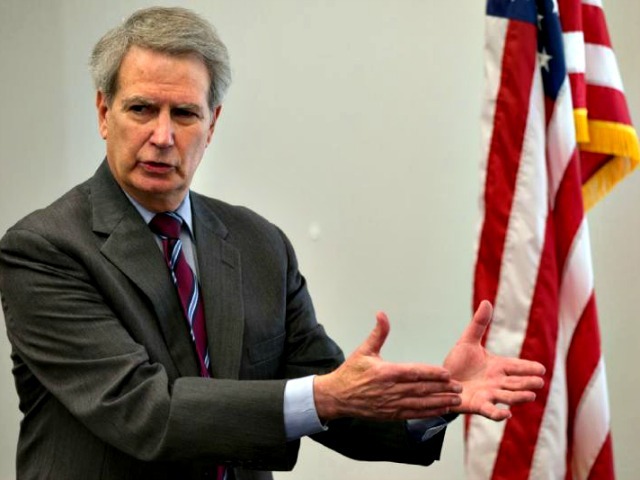 And Rep. Walter Jones (R-NC), in a brief interview with Breitbart News on Tuesday, said he’s upset with Boehner and with Obama for not going through the constitutional process on this matter. Jones referred to a bipartisan letter he and 11 other members–Reps. James McGovern (D-MA), Tom Cole (R-OK), Barbara Lee (D-CA), Richard Nugent (R-FL), Paul Broun (R-GA), Steve Stockman (R-TX), John Garamendi (D-CA), Peter Welch (D-VT), Keith Ellison (D-MN), John Lewis (D-GA) and John Duncan (R-TN)–wrote to Boehner and Pelosi on Sept. 18 asking that they bring an authorization bill giving the president congressional authorization for strikes against ISIS in Iraq and Syria when Congress reconvenes in November. We never got a response back. I still believe sincerely that as we expand efforts that we should have a debate on the floor of the House, particularly with the incursion into Syria. The president says he’s got the authority based on the AUMF [Authorization for Use of Military Force against terrorists, a piece of legislation passed during the Bush administration in response to 9/11], but I have worked with members across the aisle to repeal the AUMF. I’ve said many times one of my biggest regrets was my vote to give President Bush the authority to bypass Congress to attack or bomb another country. For me personally, whether or not it’s justified, I think a president should have to come to Congress. Yet–until the leadership–and I don’t blame the president as much as I do the leadership. Mr. Boehner should allow Congress to debate this before the election. We asked him to let us do that and he did not, but he did allow a vote to permit the training of the Syrian ‘rebels.’ On that I voted no. Here we go again–I just think that it’s wrong. Those who wrote the Constitution warned us of these interventions around the world, even if we think they’re justified. Let’s have a debate on the floor of the House. Let’s have a vote on the floor of the House. They can make all the calls they want and that’s fine but when you really come down to it, do you follow the Constitution or not? If we don’t want to follow the Constitution, then why do we have a Constitution? It goes back to the Vietnam war and it just seems to get worse and worse. I’m the first to say that if I believe it’s justified to go into Syria and these other places, then come to Congress first and tell us and the American people that we need to make action against this enemy. But I’m asking you as president of the United States to debate and vote, but we don’t do it anymore. That’s what frustrates many of us in Congress. I would be in favor of going back to debate and to have a vote, but I think it’s too late. I think it should have been before the president made this decision to bomb in Syria and I think there were many of us in both parties who thought that while we were gone he would bomb in Syria. My thinking is that Speaker Boehner made a mistake of not following the lead of McGovern, Jones and Lee [the lead signers of that letter], to bring this to the floor before we left. Now it will be after the fact, and I’m sure there will be more bombing over the next few days and the fact is that we did not meet our Constitutional duty. I’m very disappointed, that’s the best way I can say it.